Every time I blog a wedding, my heart is flooded with incredible memories and moments from the day. This post especially makes me giddy, and teary eyed, on so many levels. When Joanne first got in contact with me she said were eloping, at Treehouse Point, and we want you to be our photographer. I was SO excited for them! 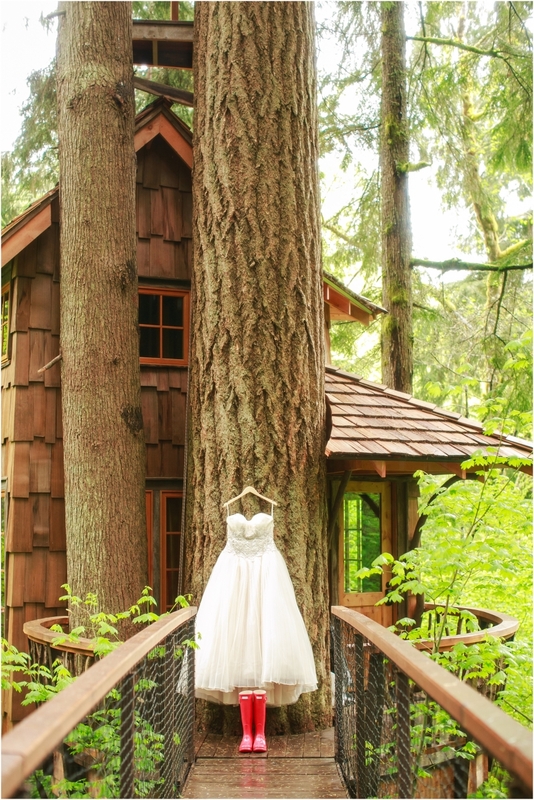 Treehouse Point is an amazing place to stay, and of course, to get married! Joanne and Chris started making plans to head to the states from Canada for their special day! I was booked for a wedding in Texas the Saturday before their Sunday wedding, but they insisted that if I could get back in time, they were set on me photographing their elopement! After a cancelled flight, an all-night travel to another city thanks to a very good friend (Thank you Amanda Bailey!) and a very early flight, I made it! The best part-due to their cell phones, Joanne and Chris had no idea the trek I had made to get to their wedding! Joanne and Chris have been together a long time! They already have a beautiful family together, so the elopement was the cherry on top! Treehouse Point is one of the most magical places you could get married. And in true Pacific Northwest style-it was raining! But with a little pre-wedding Skype planning, we made sure Joanne was totally prepared-she rocked adorable Hunter rain boots and brought awesome clear umbrellas along for the day! This was such an amazing experience for me. Not only did I photograph their amazing day, but I also was a witness & signed on their marriage license, and the only guest (minus their amazing officiant & the Treehouse Point team) to witness their marriage vows. I felt so incredible honored and humbled that they chose me to be there with them. I even helped Joanne put her wedding dress on, while taking photos as well! (Thats a first for me!) Joanne and Chris, I wish you and your sweet children a lifetime of love and happiness. Youre some of the most kind and loving people I have ever met. Now that their family and friends know they eloped, enjoy their images!